Even before moving back to the NW, I was very concerned that I was dragging my family – in particular my wife – to Oregon against their will. Of course we prayed about it and felt led in this direction, but still, my excitement to return to Oregon was great. Even before it fully unfolded, The Wife and I were talking. I was being quite subdued, but at one point she looked at me and said: “You’re pretty excited about this aren’t you?” I was. I was thrilled. I knew she’d like it. I knew that once we got through the grey of Winter, she would see the beauty. This afternoon I looked out the window to a beautiful sight. I wanted to run and get my camera, but I didn’t want to miss a moment of the scene unfolding before me. 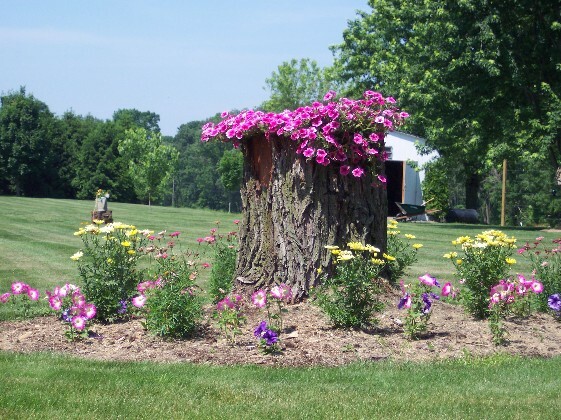 In the backyard of our house there is an even larger rotting stump and my wife was planting more flowers in that one. My Darling Daughter was watching and my Smiling Son was in the backpack on The Wife’s back. It was idyllic scene and my love welled up inside of me for that family circle enjoying our dream home. We have acres of forest in our backyard (even though we don’t own more than 1/2 acre). It is a beautiful Springtime after a hard winter. My family survived the hardship of moving and my wife was using her creative talents decorating our backyard – in ways she has always dreamed. Praise the LORD! Awesome to hear about you and the family. God is good. I couldn’t help but re-feel many of the same feelings when I moved my wife away from Myrtle Beach to Castle Rock.